Corded window coverings are one of the top five hidden hazards in American homes. Pittsburgh Corning is dedicated to raising awareness and urging parents and caregivers to replace them with safer products. Pittsburgh Corning Glass Block provide security and privacy. Pittsburgh Corning has spent three quarters of a century developing glass block products and systems that keep people and properties safe and secure. October begins a nationwide window cord safety effort aided by glass block manufacturer, Pittsburgh Corning. Exposed or dangling cords can pose a strangulation hazard to young children and pets, according to the Window Covering Safety Council (WCSC). Pittsburgh Corning is raising awareness for the October window cord awareness campaign by promoting alternative home safety windows. “As a leader in glass block home improvement products that stand the test of time, safety is important to us. Our LightWise Residential Windows aim to provide both protection and peace-of-mind,” says Mary Lynn Bruce. Window coverings are one of the top five hidden hazards in American homes, with young children and pets dying each year from accidentally strangling in window cords, according to the Consumer Product Safety Commission (CPSC). One recommendation given by the WCSC to parents and caregivers include installing only cordless window coverings in homes. 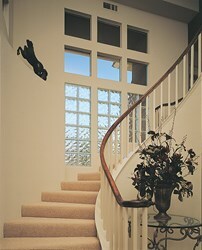 Glass block windows eliminate the need for window coverings. Designed with your specific needs in mind, they are thick and break-resistant thus enhancing the security of homes. Other benefits include their thermal efficiency which reduces energy costs and helps keep homes comfortable, privacy with natural light which brightens rooms and eliminates the need for curtains, efficient sound barrier that reduces noise from outside keeping homes quiet, and their versatile pattern selection great for bathrooms, kitchens, garages and door sidelights. For more information, visit http://pittsburghcorning.com/. Pittsburgh Corning Glass Block can add a safety factor to your bath.